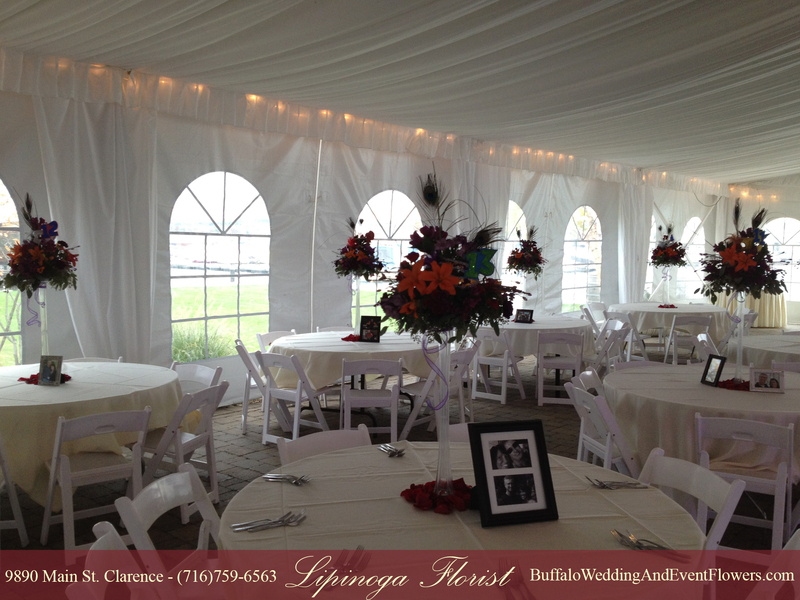 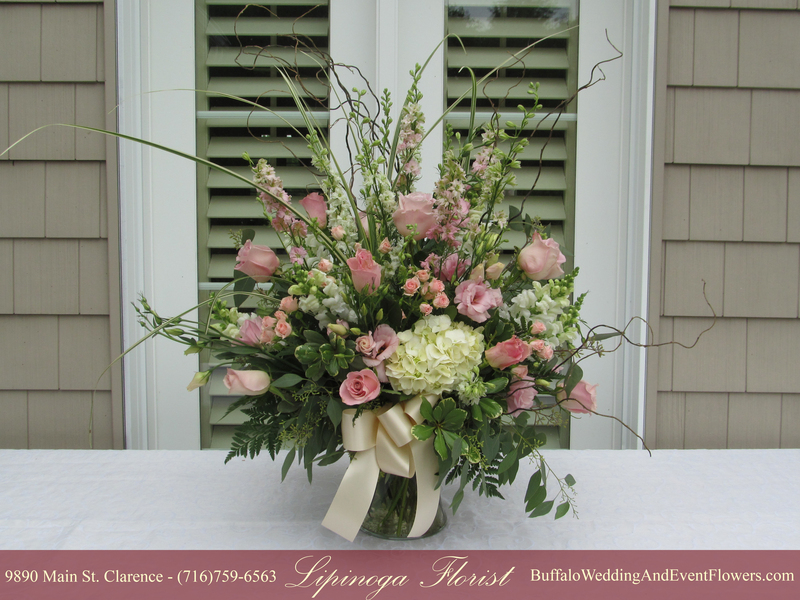 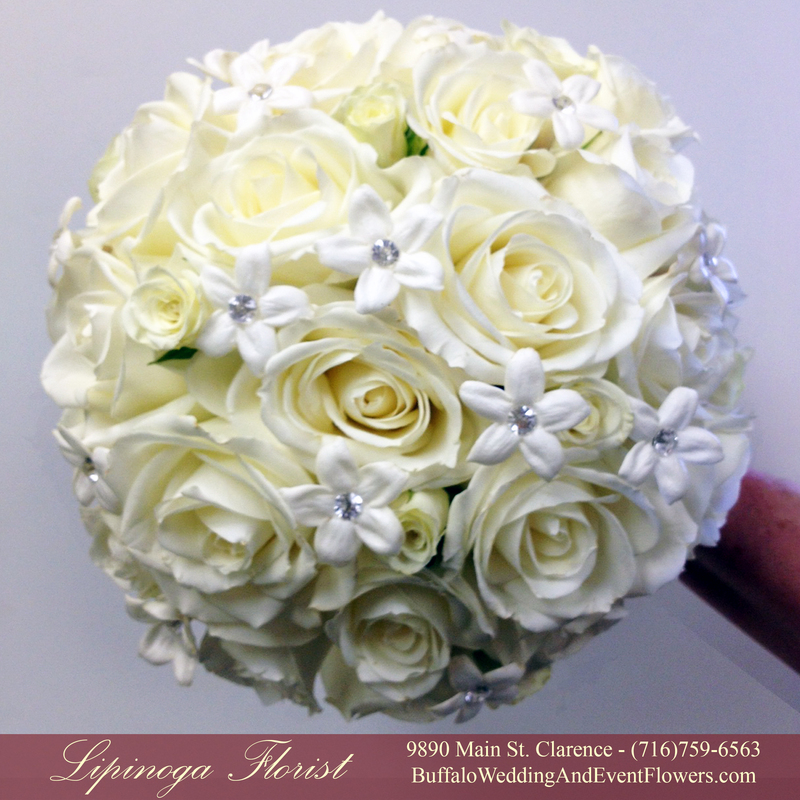 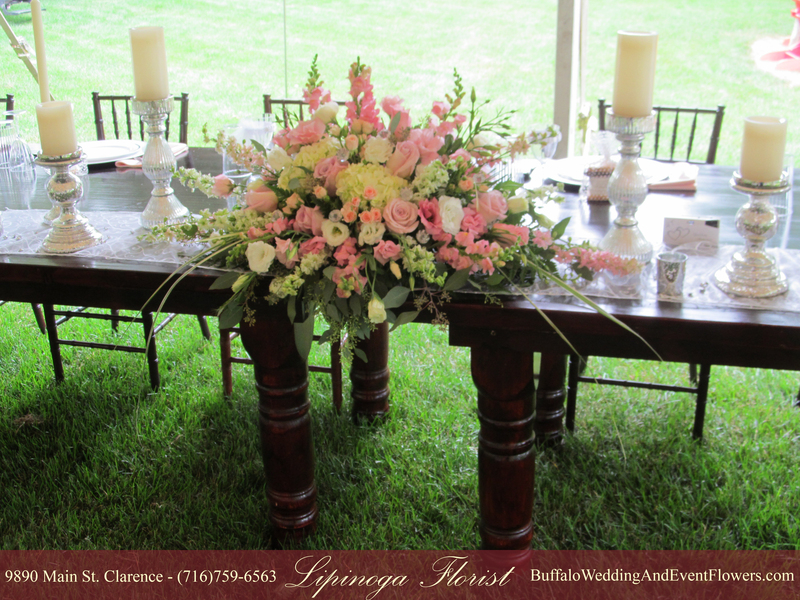 Rustic yet elegant flowers created beautiful ambiance for this wedding held at Holiday Valley in Ellicottville, NY. 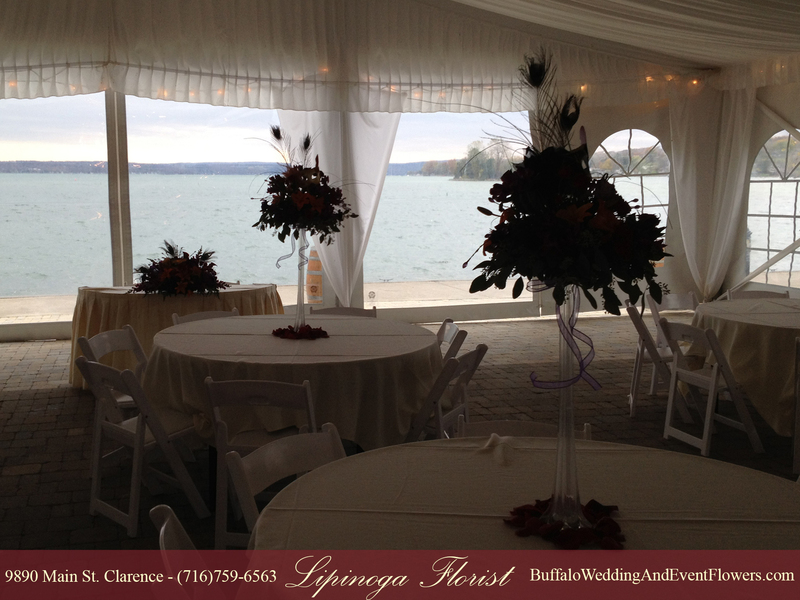 The mountain top ceremony was enhanced by a rustic arbor with an asymmetrical floral adornment to frame the gorgeous views. 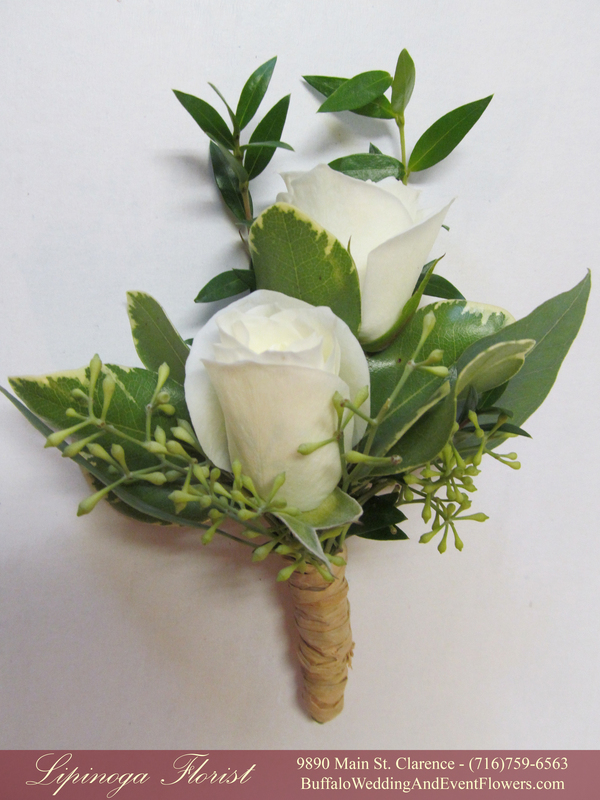 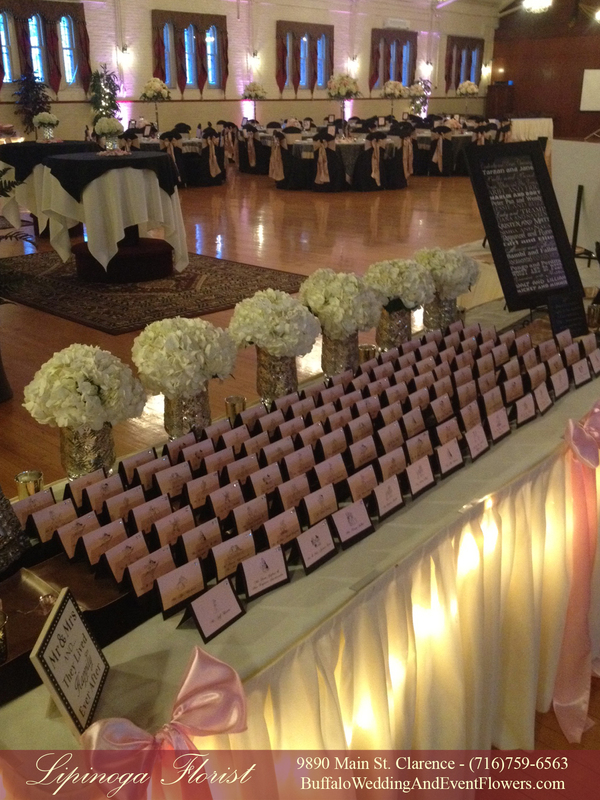 The aisle was scattered with white rose petals. 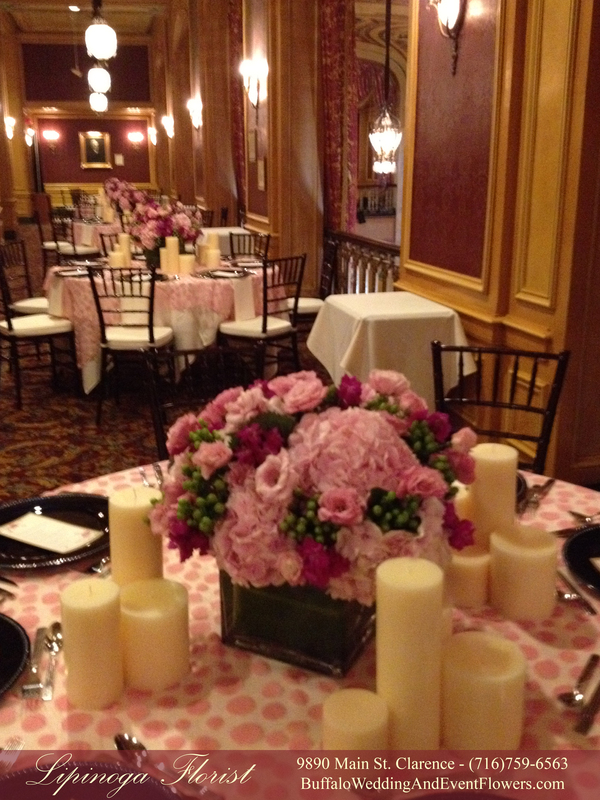 Guests were greeted by white flower arrangements at the beginning of the aisleway. 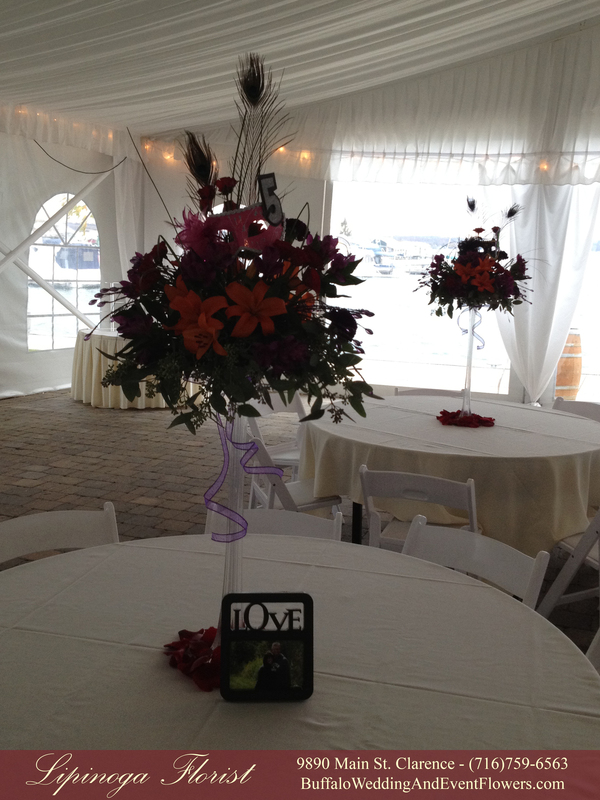 Guests came back down the mountain for a gorgeous reception held in the main lodge at Holiday Valley. 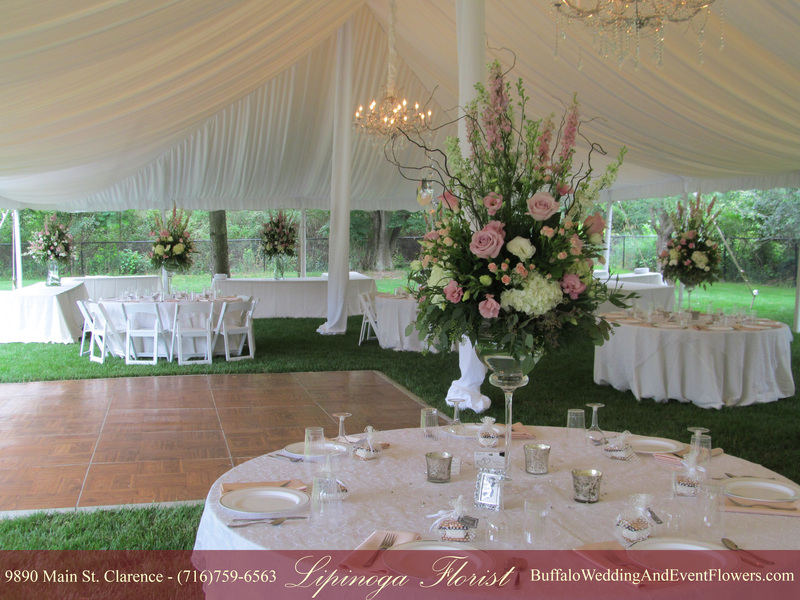 Lush greenery and white blossoms with a touch of fuchsia accent flowers were placed throughout the lodge. 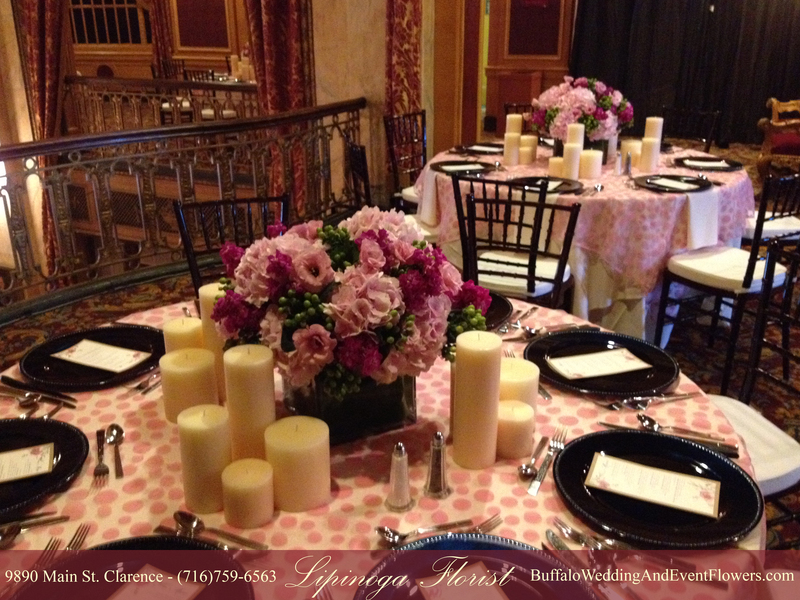 Large arrangements in stone-like rental pots added a pop of color and texture to the fireplace and adjacent to the sweetheart table. 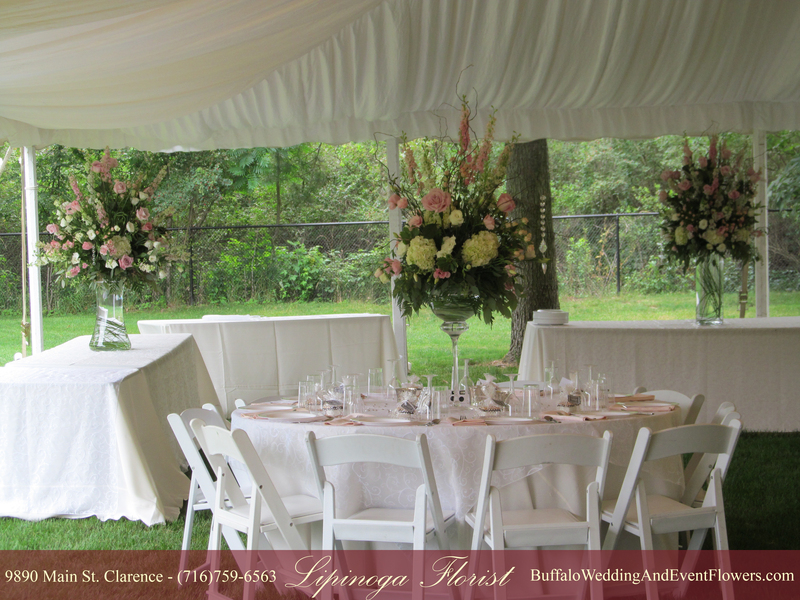 A rustic combination of blossoms and burlap ribbon meddled with an assortment of lush greenery created a beautiful focal point for the happy couple on their sweetheart table. 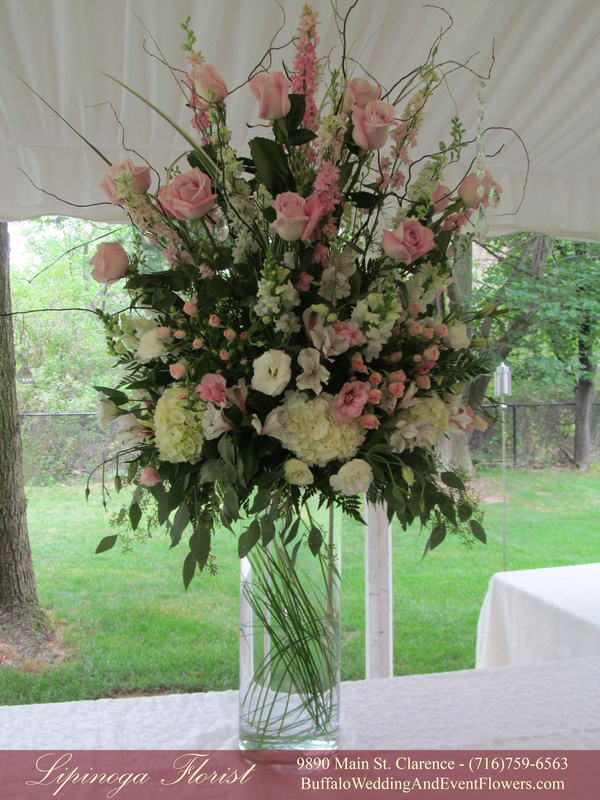 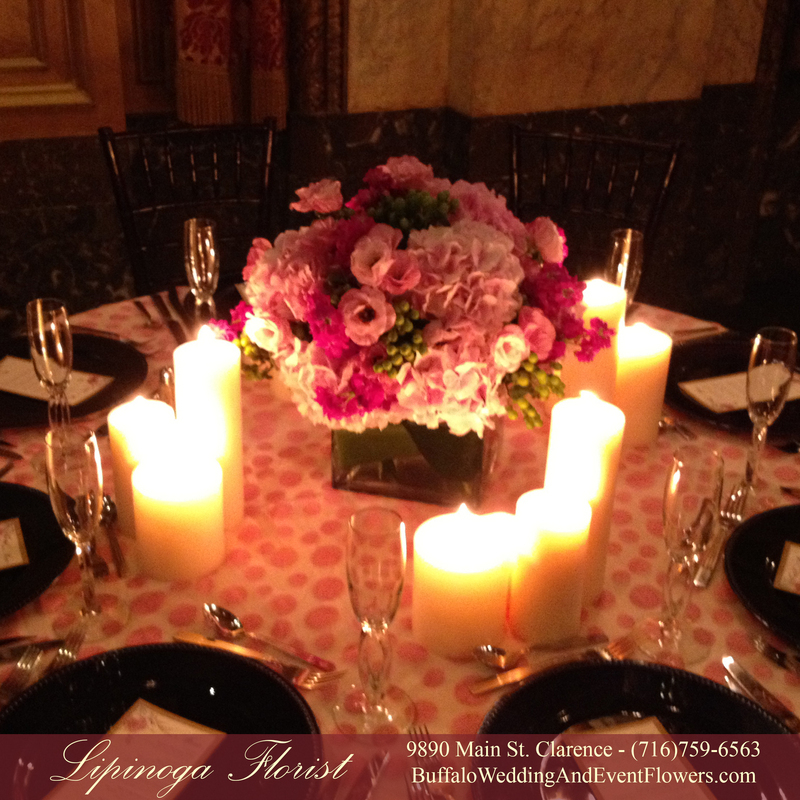 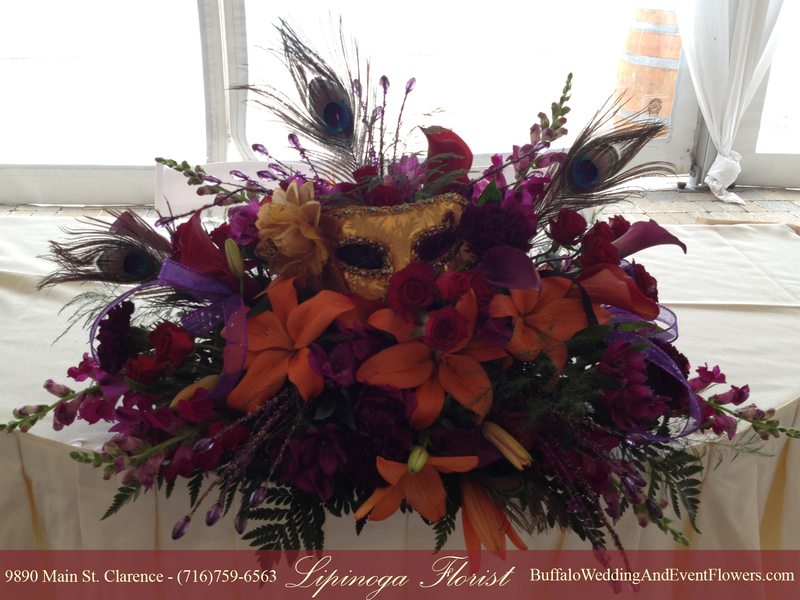 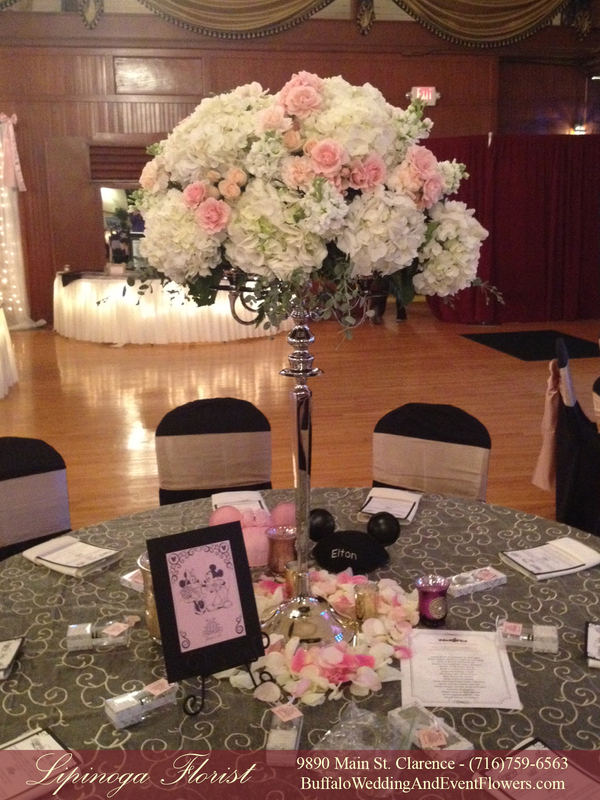 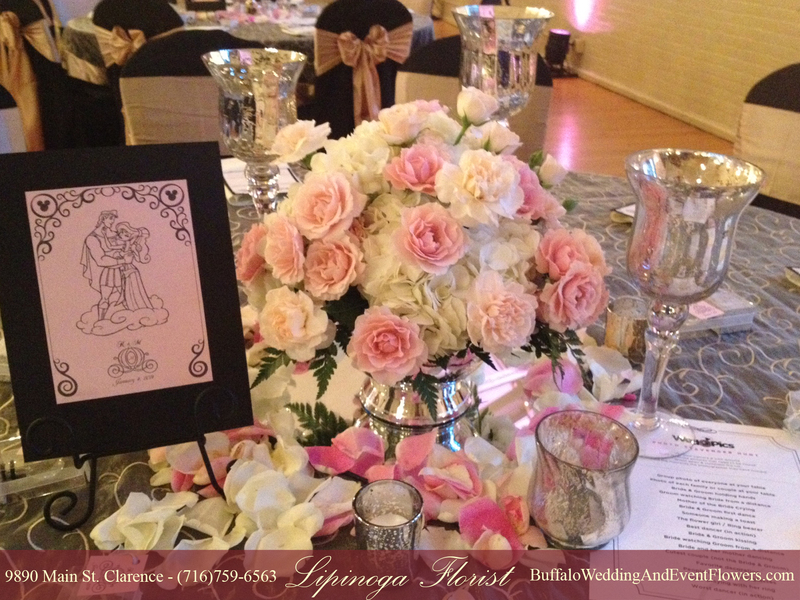 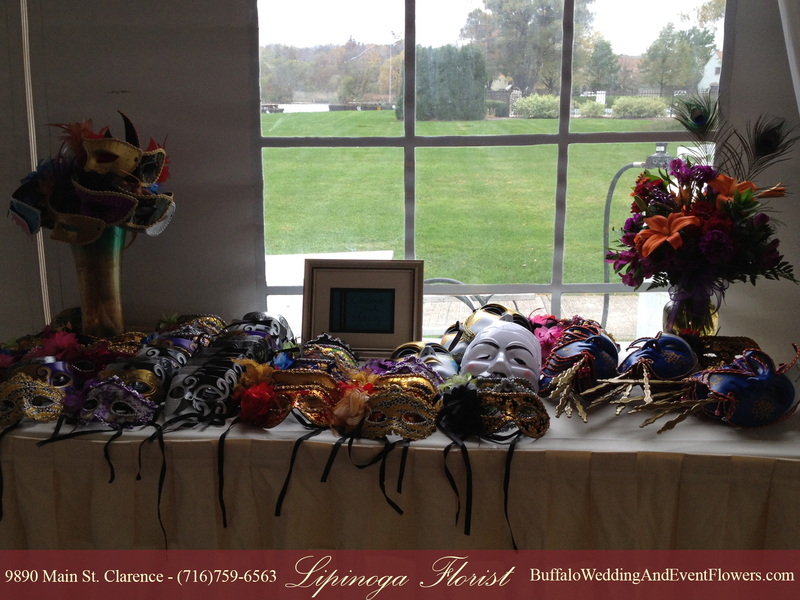 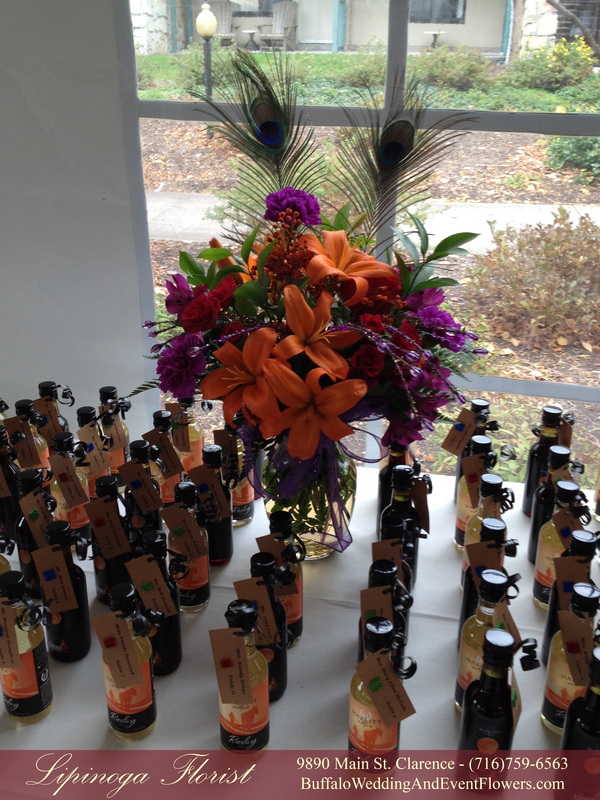 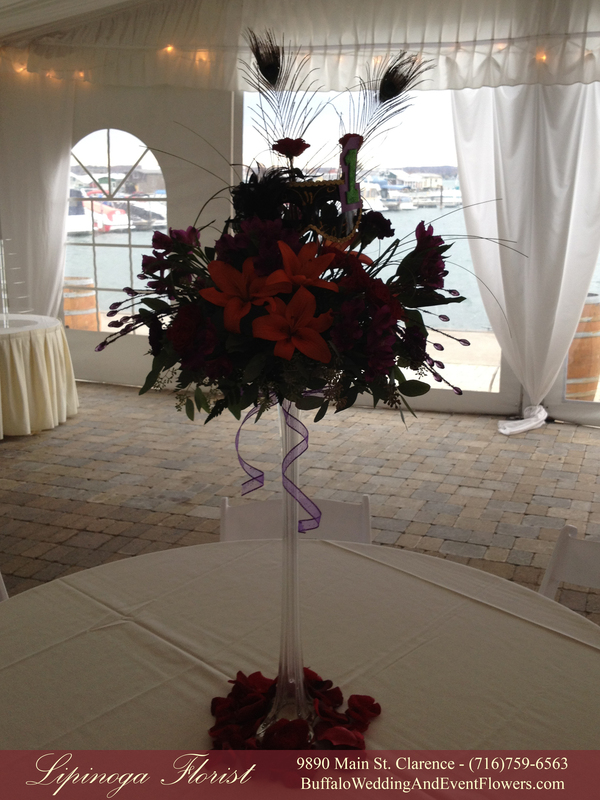 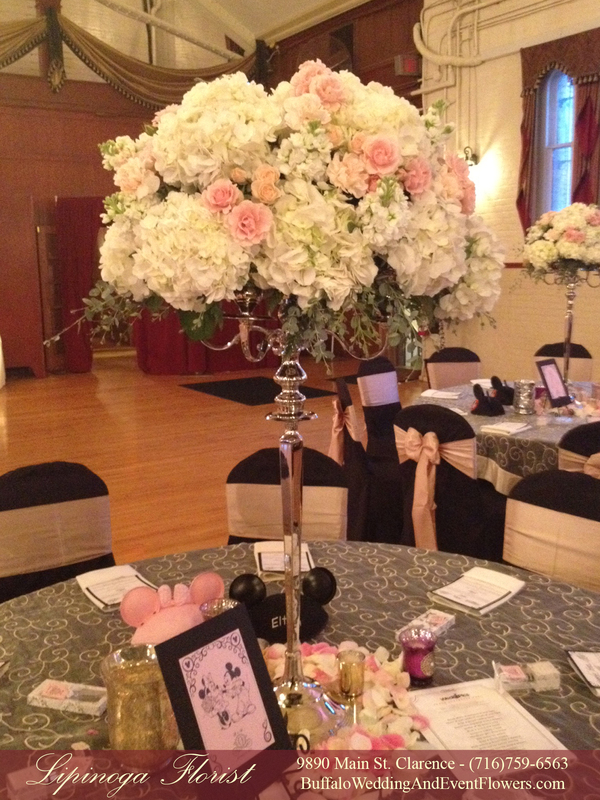 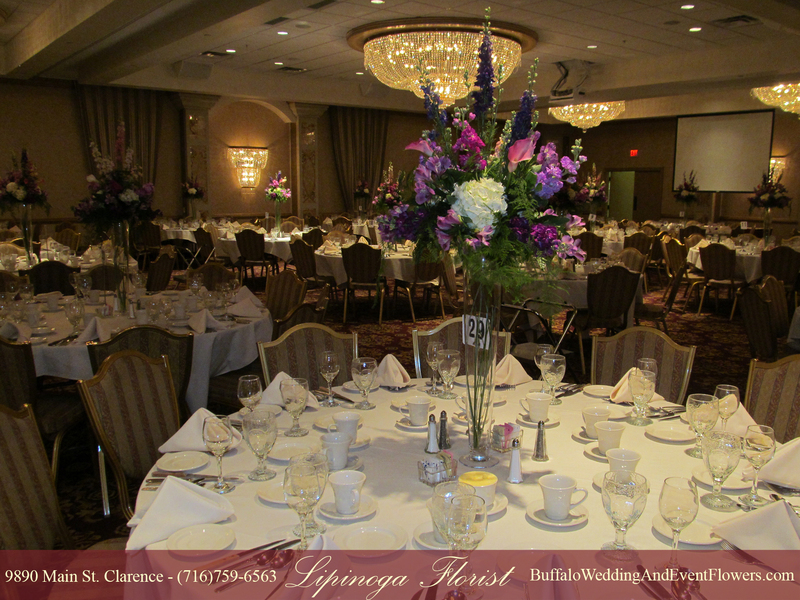 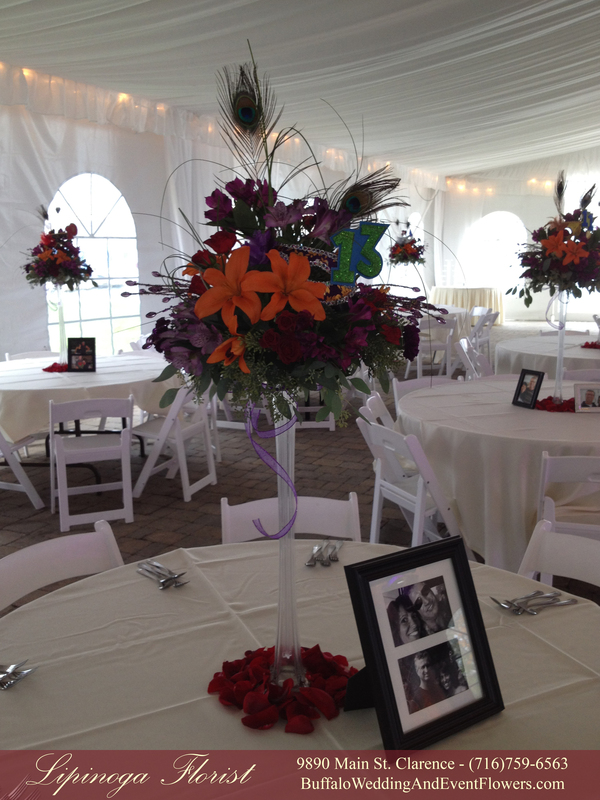 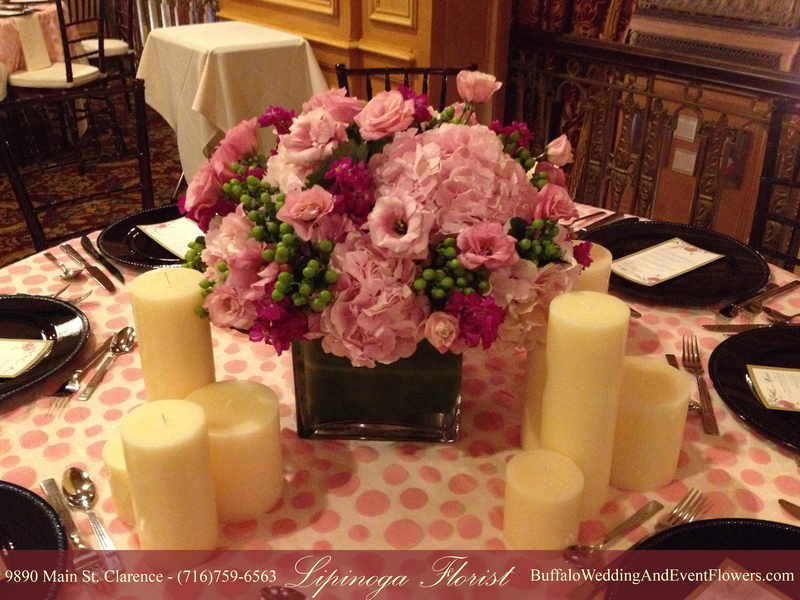 A portion of the tables had tall centerpieces in rental cylinder vases from Lipinoga Florist. 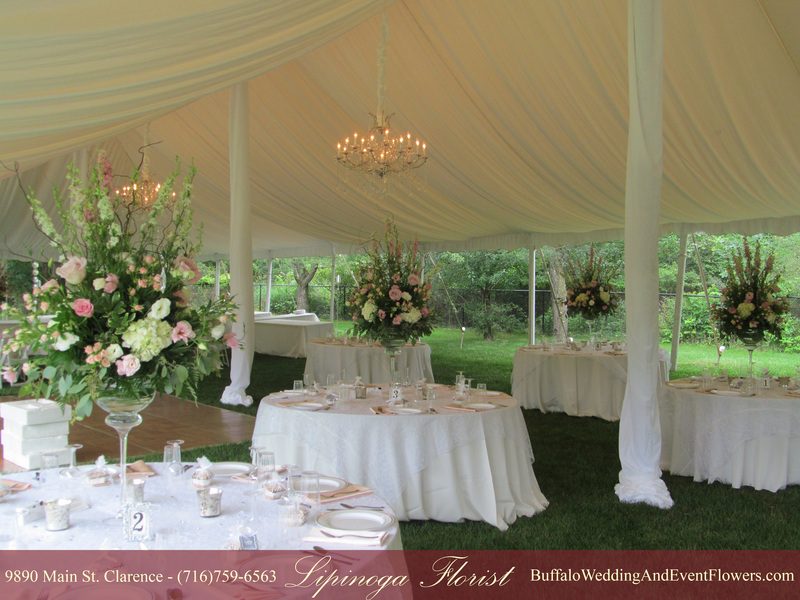 The height offset the soaring ceilings of the main lodge at Holiday Valley. 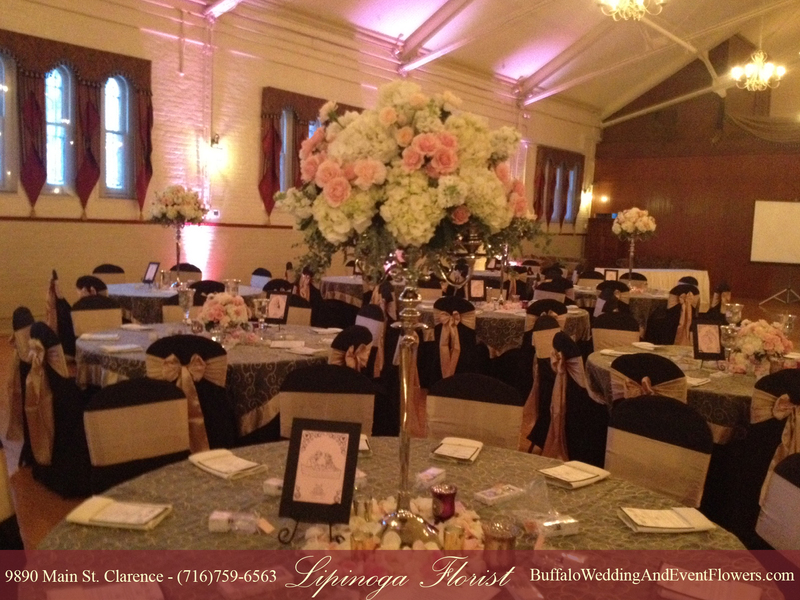 Low arrangements with a lantern in the center added to the rustic vibe for the remaining tables and on the accent and place card tables. 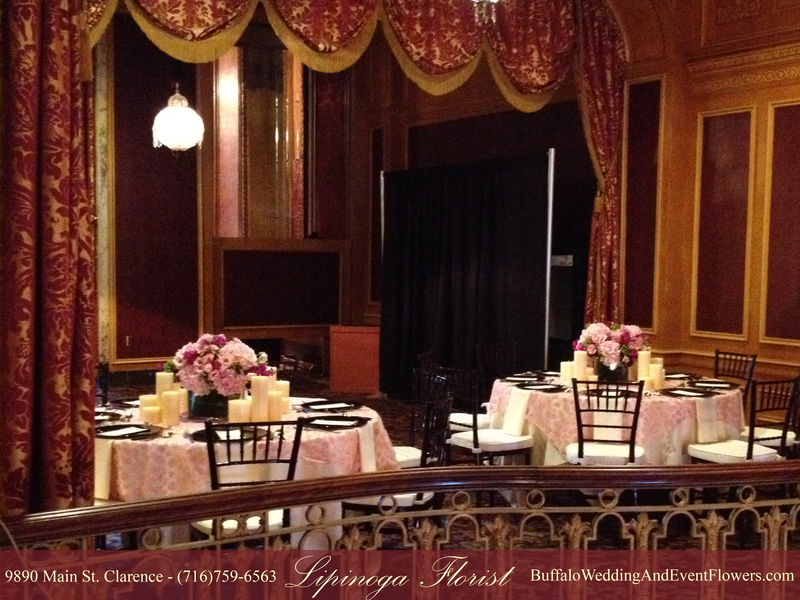 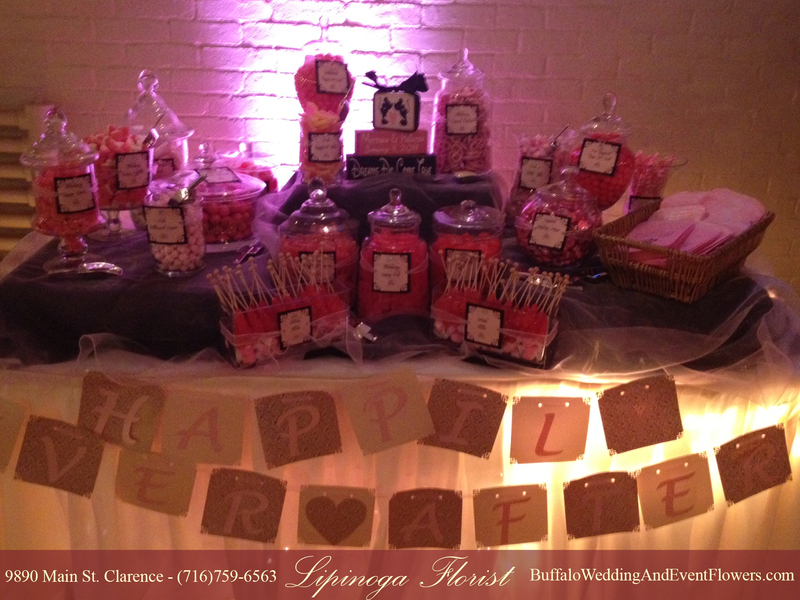 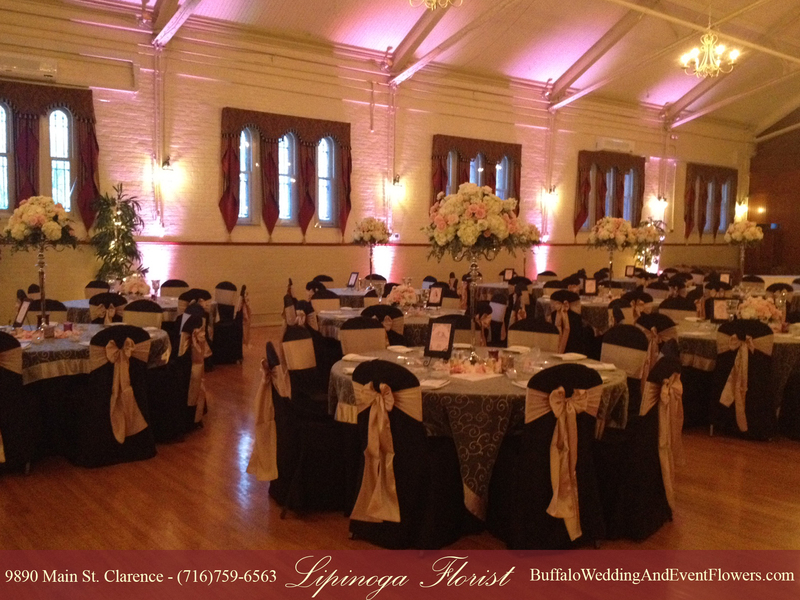 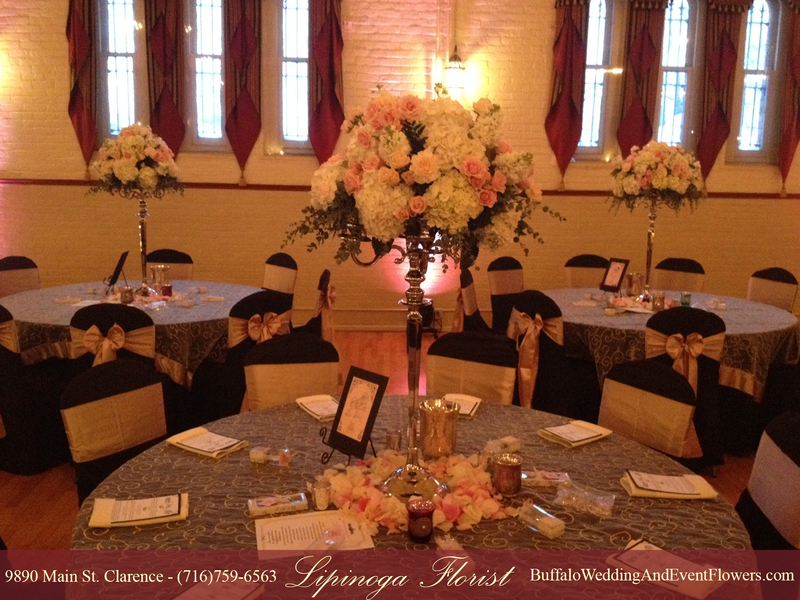 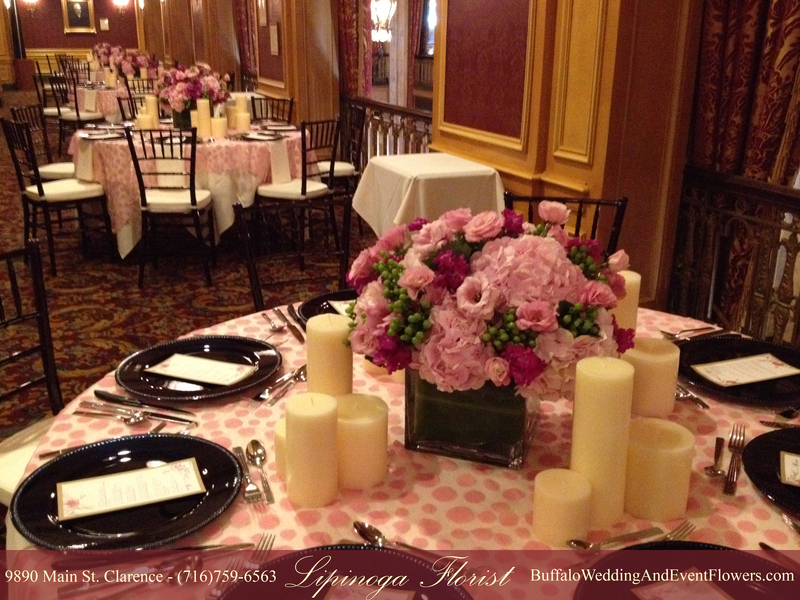 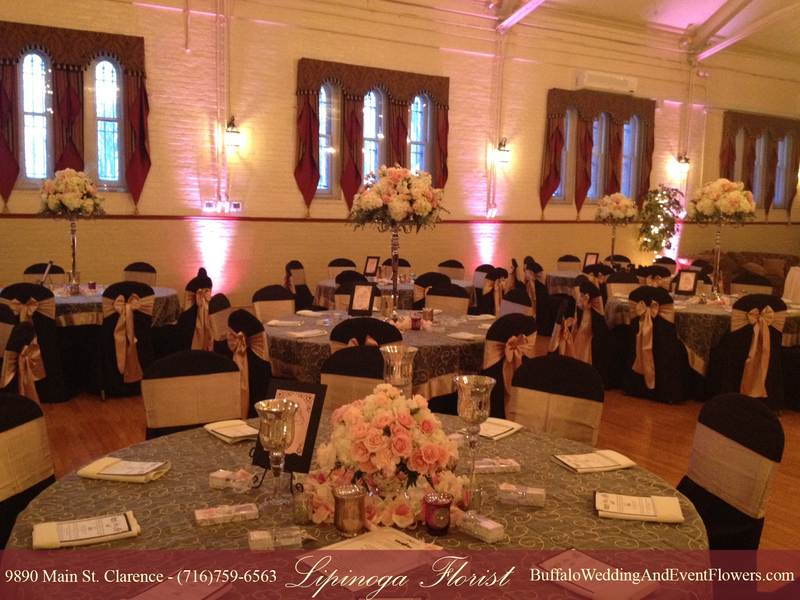 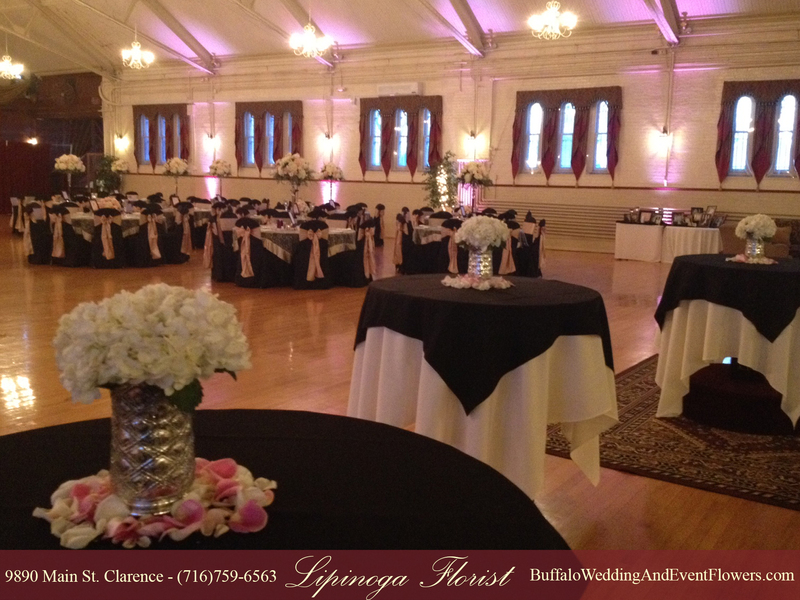 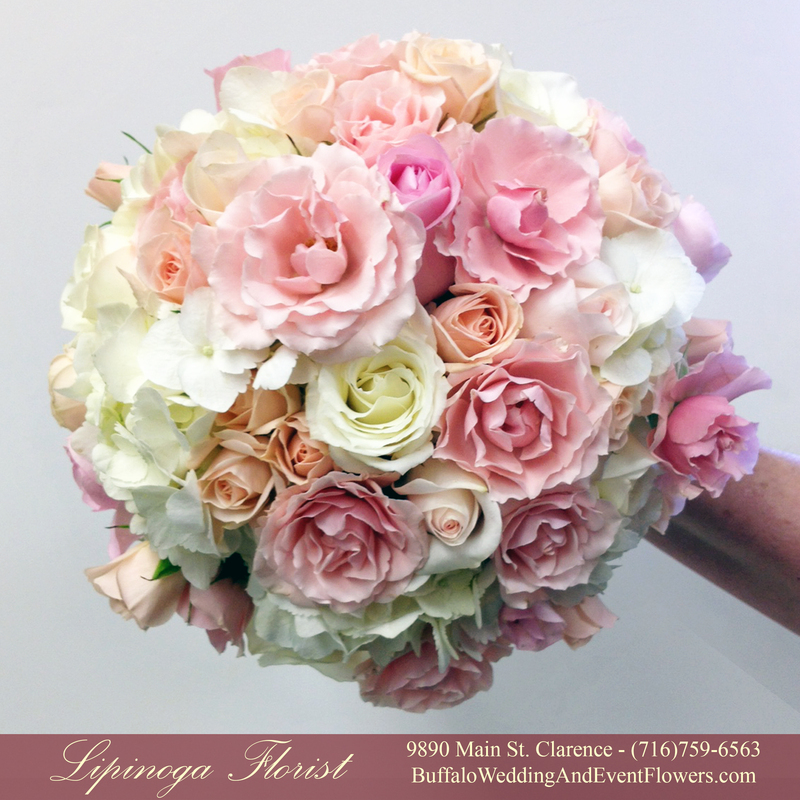 Soft and Medium Pink Blossoms accented by green berries were skillfully arranged into lush centerpieces for this elegant wedding held at Shea’s in Downtown Buffalo. 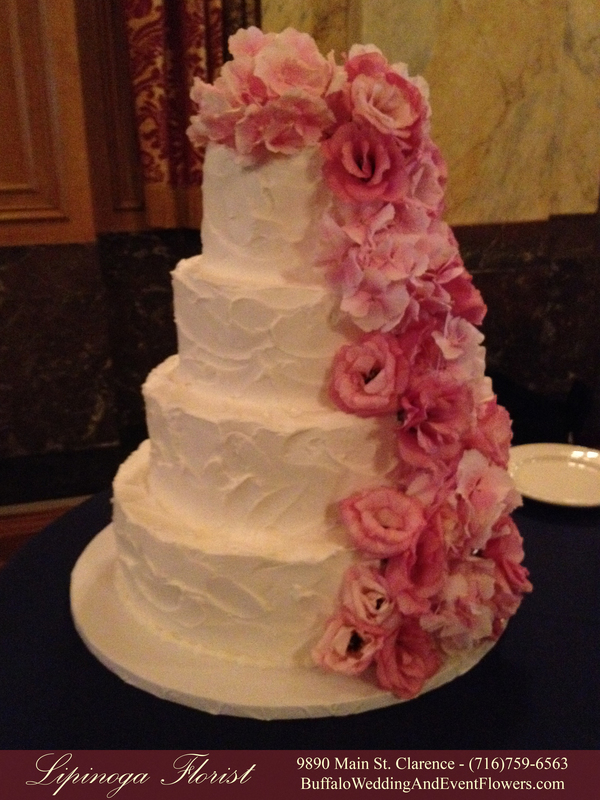 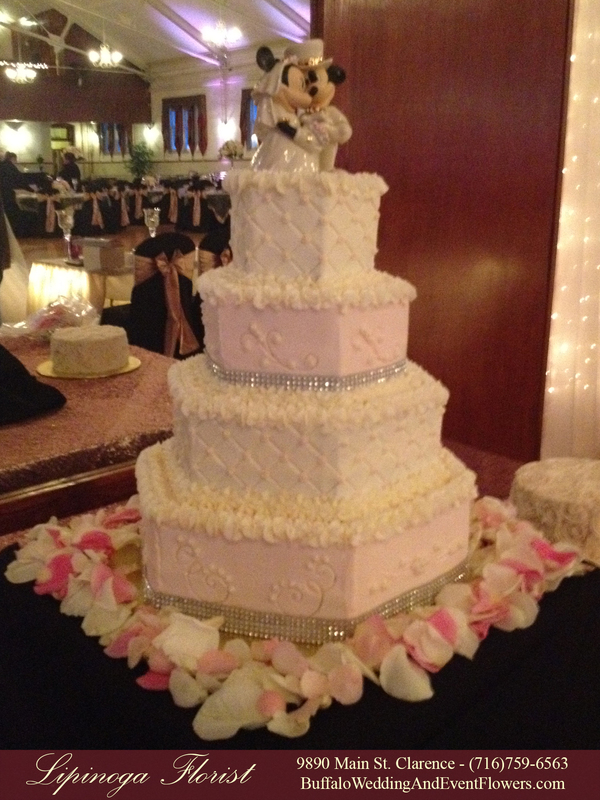 The cake was accented by pink blossoms arranged in a waterfall style. 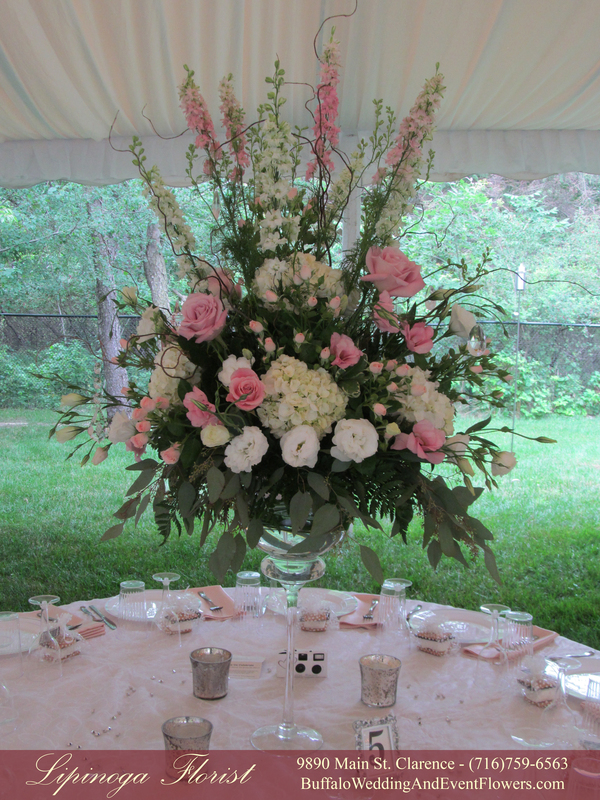 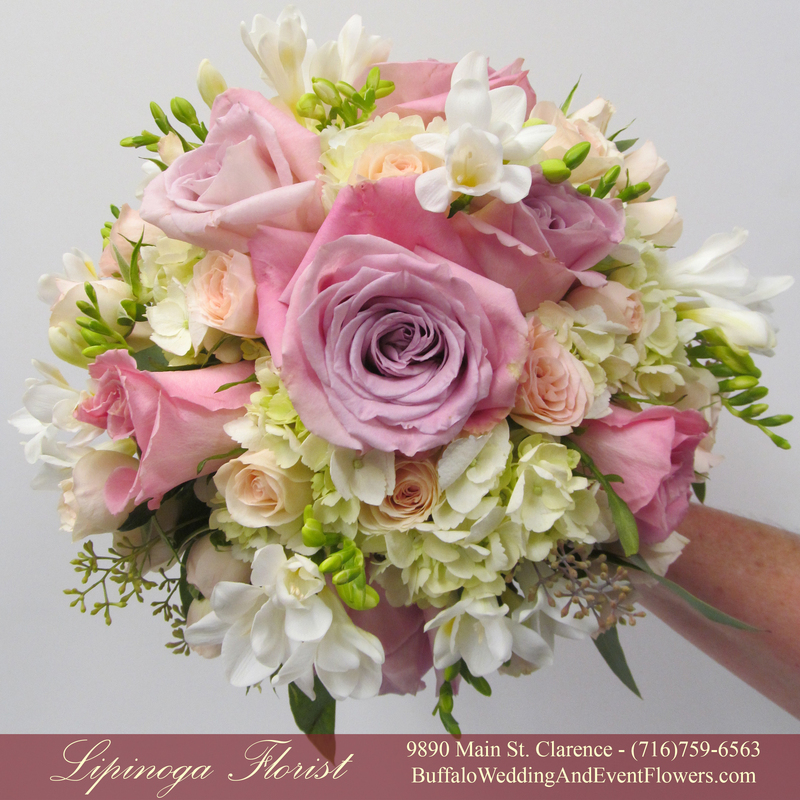 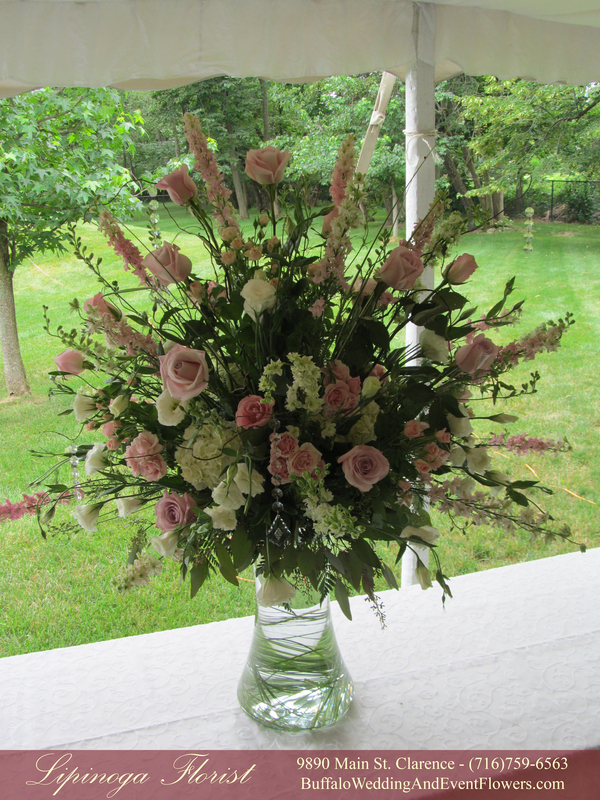 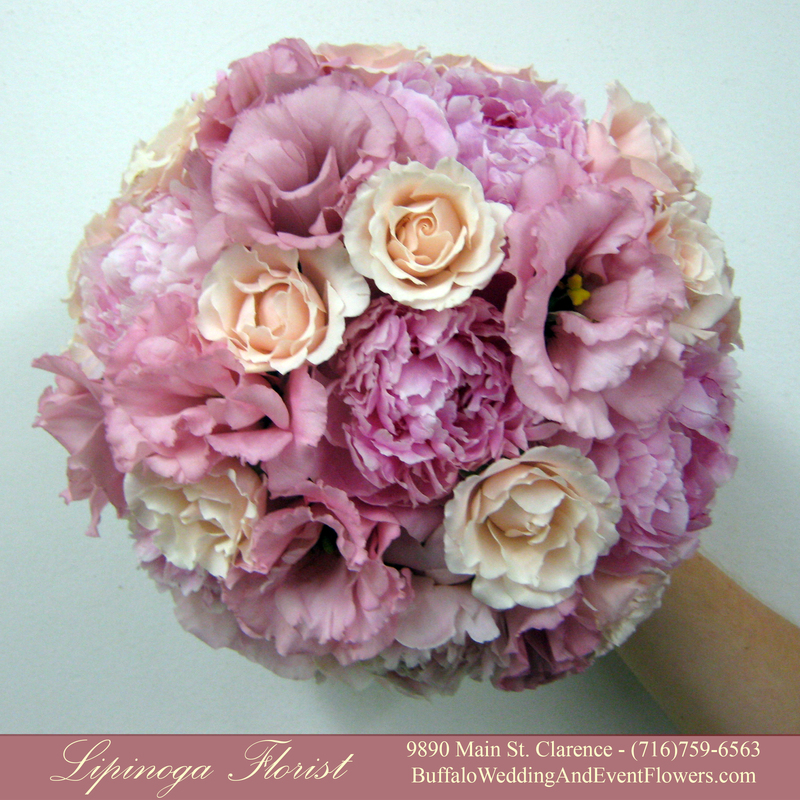 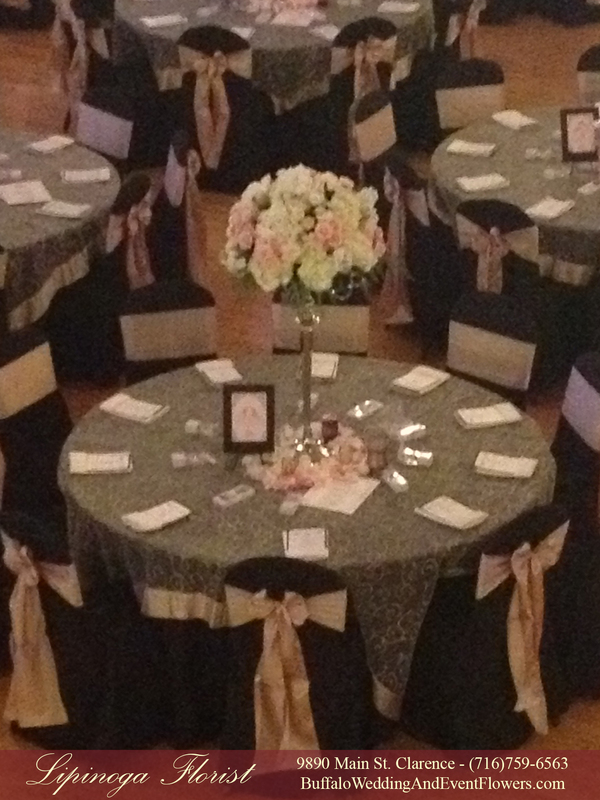 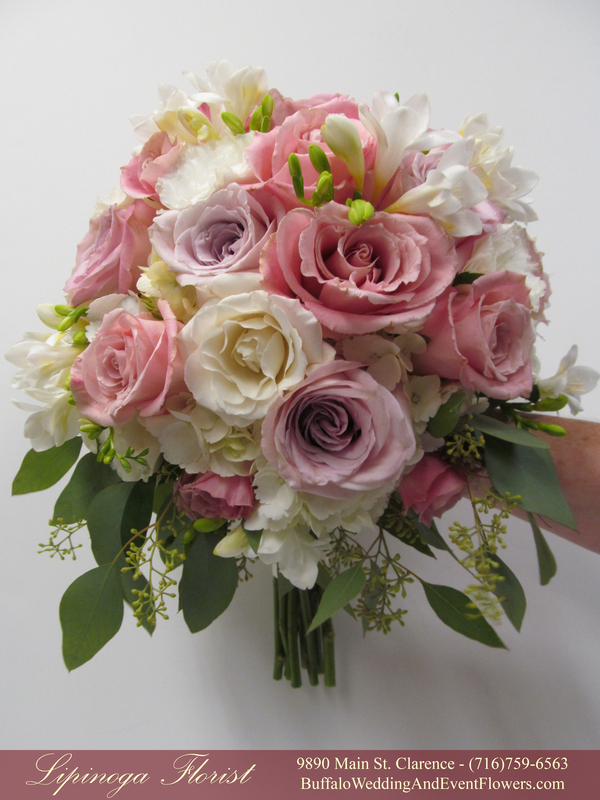 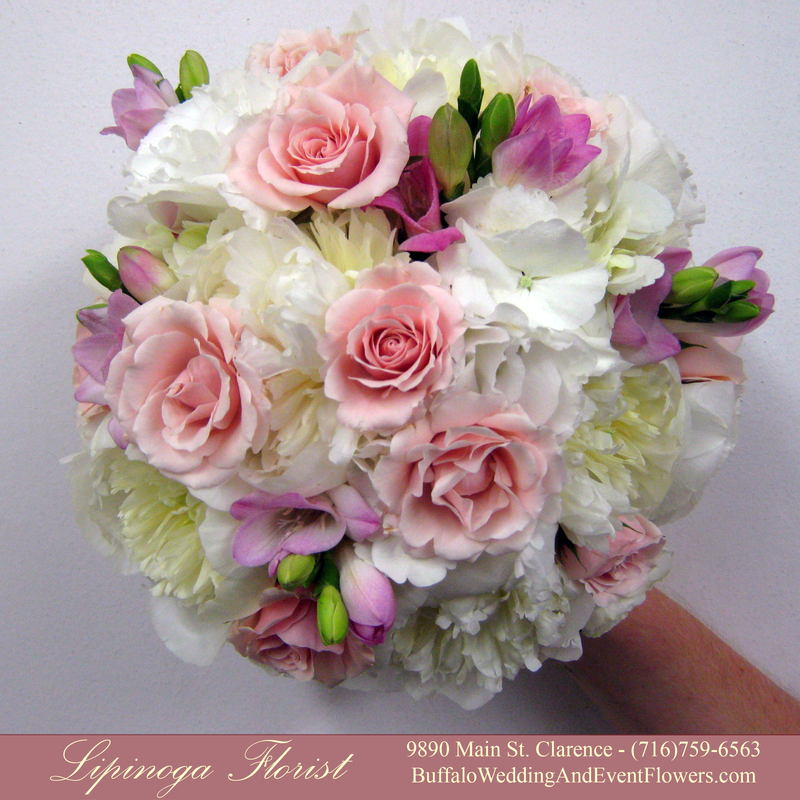 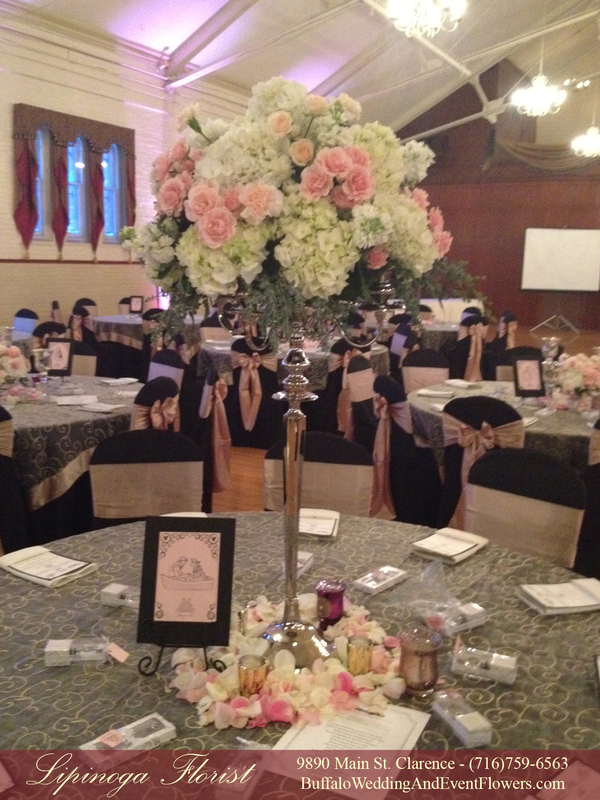 The Bouquets included a beautiful combination of pink and white flowers that were very soft and romantic. 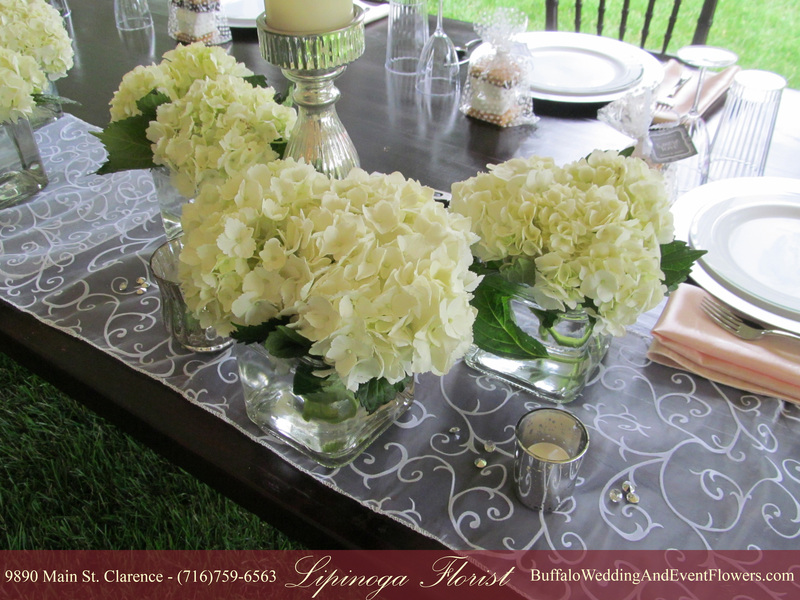 Beautiful glass cubes lined with a large leaf were filled in a low and lush arrangement. 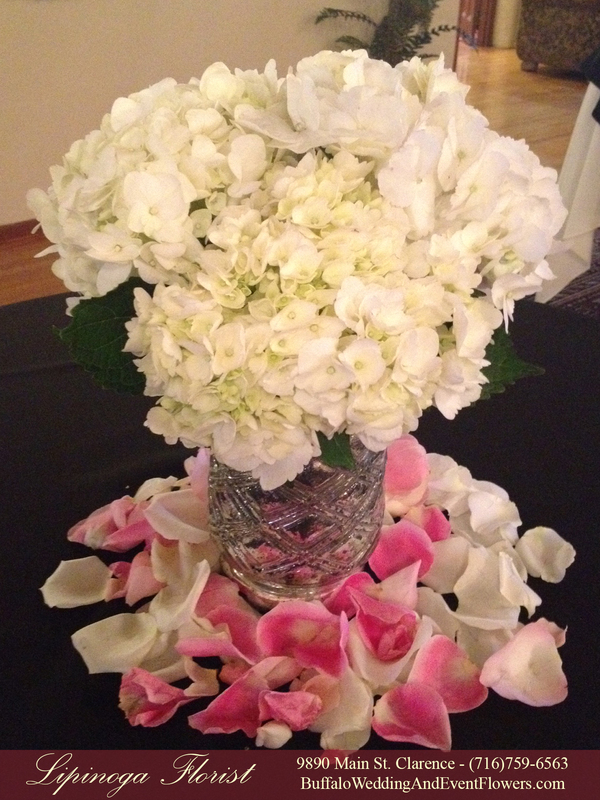 Light and Medium Pink Petals created a pretty display with pops of fuchsia and green. 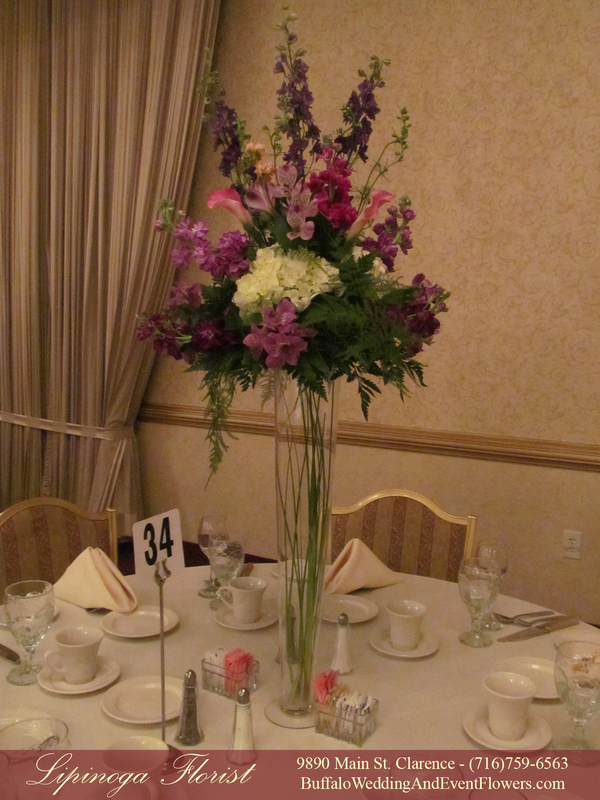 Pretty Purple Petals greeted guests for a beautiful springtime dinner reception at Salvatore’s Italian Gardens in Lancaster, NY. 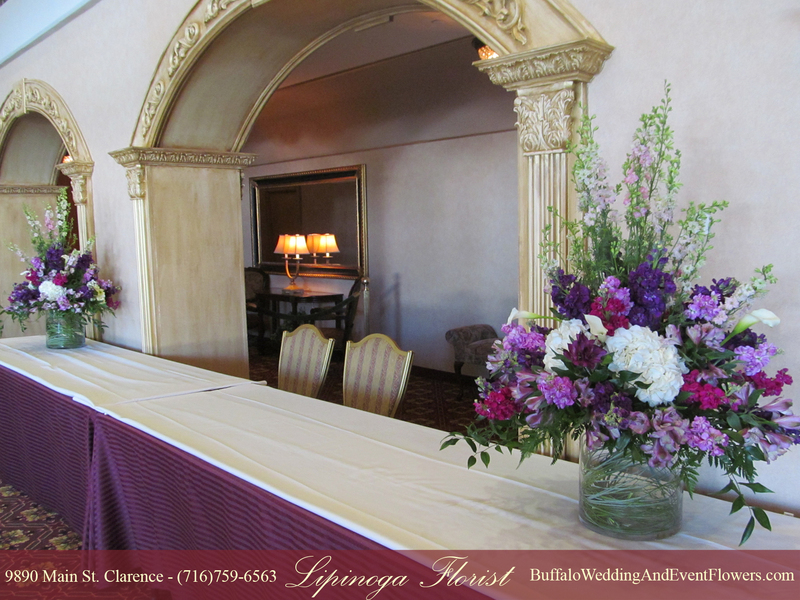 Large arrangements flanked each end of the entry table in the foyer to greet guests in a beautiful manner. 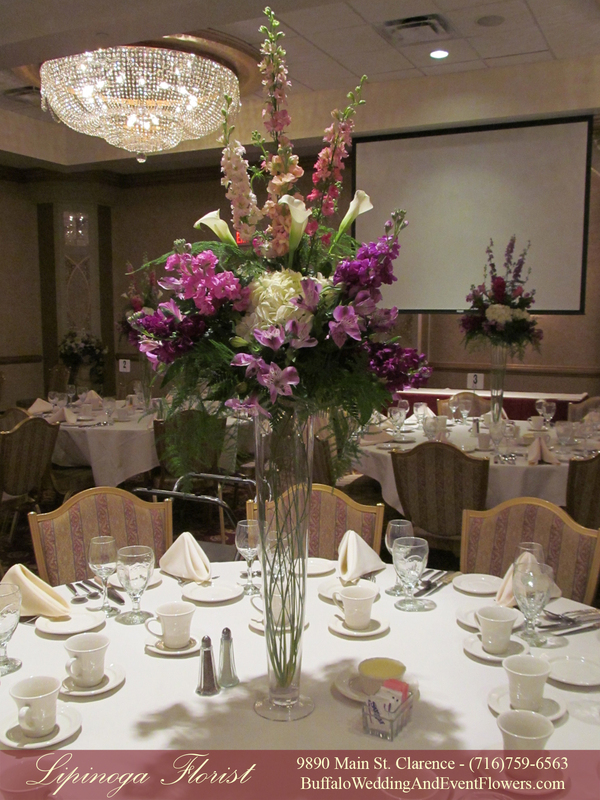 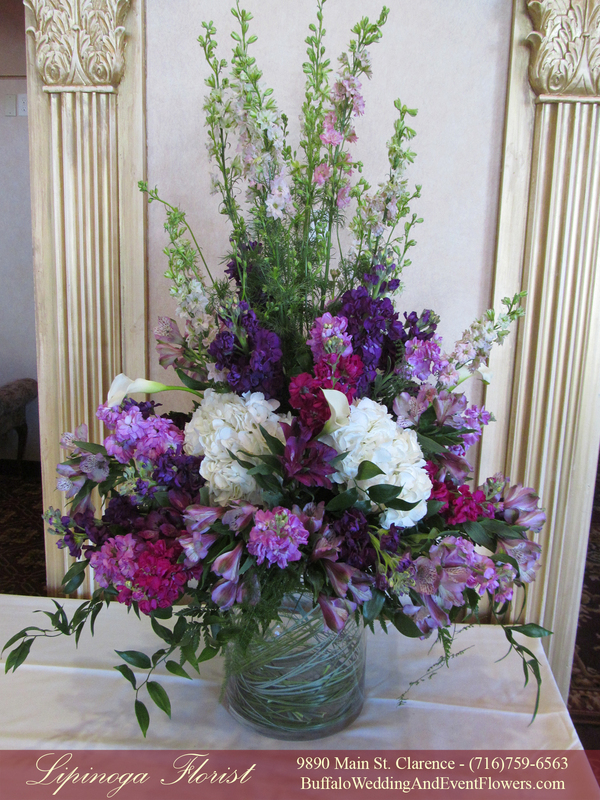 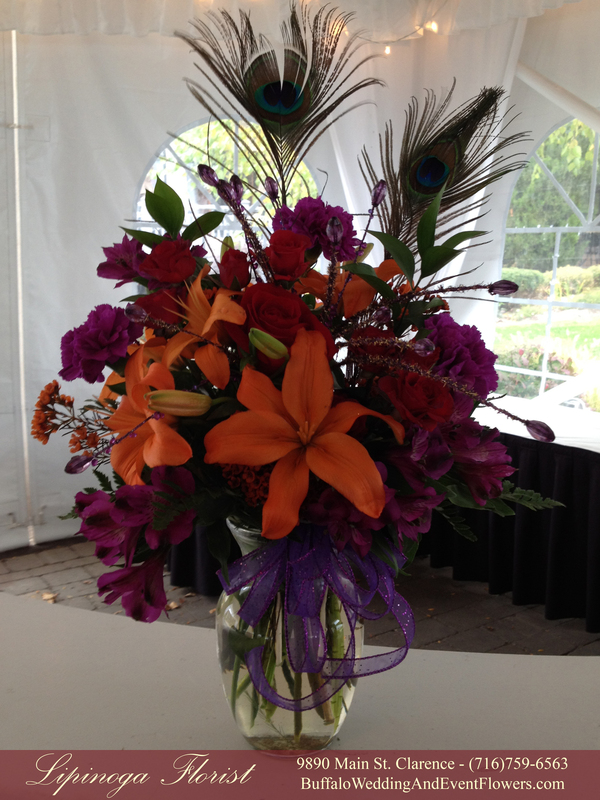 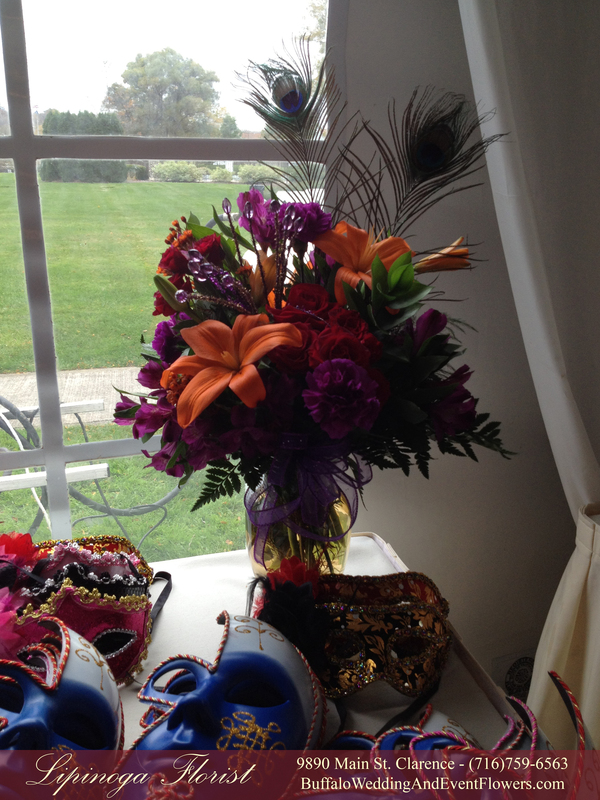 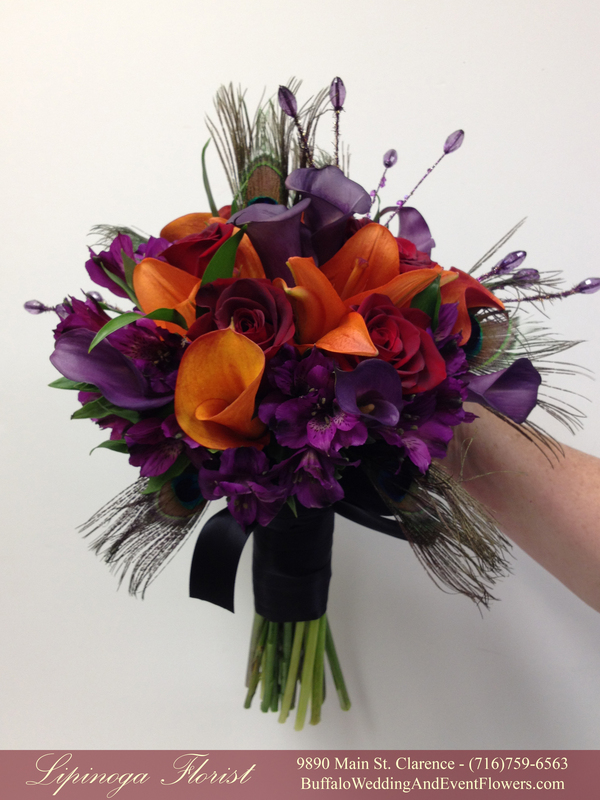 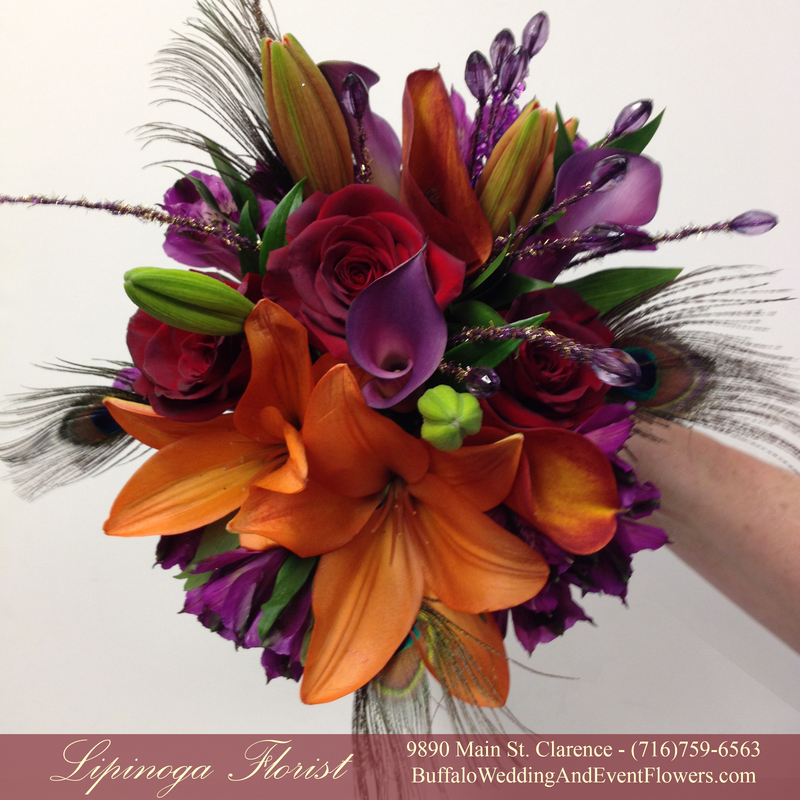 Tall floral arrangements including hydrangea, mini calla lilies, stock and larkspur were arranged upon pilsner vases. 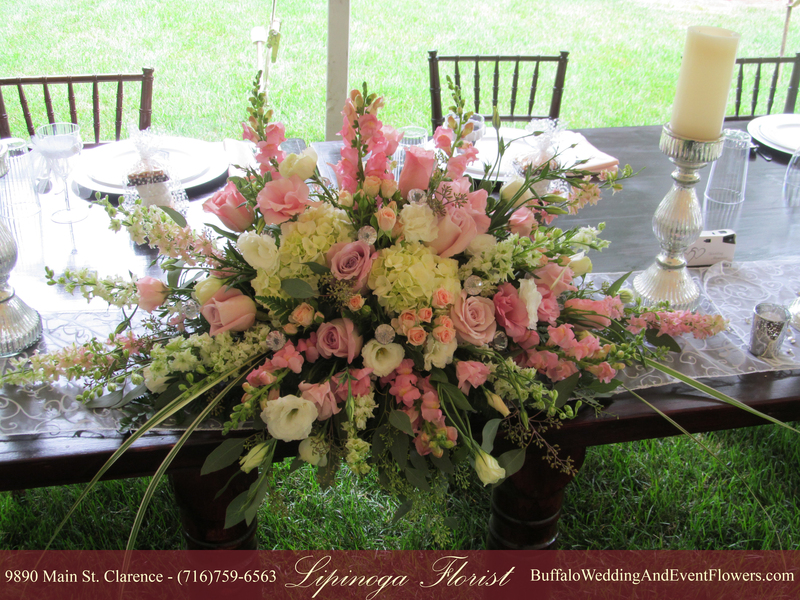 Lipinoga Florist has an extensive selection of vases including the pilsners shown here available for rent for weddings & special events.